Hello people of the internet!!! On today’s ‘YouTube Wednesday’ we’re going to continue our Back To School trend and talk about a YouTuber that will help you make AMAZING DIY projects. With school right around the corner you have to save all the money that you can because school supplies, clothes, books, and everything else is expensive (and of course you gotta go to school looking cute). So if you wanna go to school with inexpensive, unique, cute supplies, t-shirts, or room décor (or dorm décor for anybody in college), then please read on to see why ‘DIYlover89’ will be your new fav YouTube channel. Ready? Ok, let’s go!!! The first video that we’re going to talk about is DIYlover’s ‘Instagram/Polaroid magnets! !’ video, which was uploaded on January 15th, 2014 (you can check it out below). This is a really cool video that will show you how to take your favorite Instagram memories, and make them into cool magnets that will make your room or locker look completely unique. Bonus points, these magnets will also hold your important papers so you won’t lose anything! The next video that we’re going to talk about is DIYlover’s ‘DIY Tumblr inspired room décor ideas!’ video, which was uploaded on July 19th, 2014. 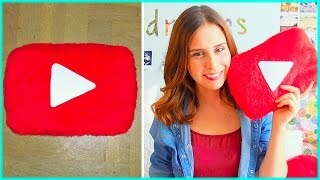 This video has 3 projects that you can do in order to end up with cool pillows and room décor that will make your room Insta & Tumblr approved. The video takes you step by step through each project so any one can follow and end up with an incredible product that your friends will all freak out over. Next up we have the ‘DIY phone cases designs’ video, which was uploaded on March 20th, 2015. Now we all know that your phone case is a HUGE part of your Back To School style. You definitely want a lot of phone cases that will help take your outfits to a new level because your phone is one of your greatest accessories. This video will show you how to make super cute phone cases that are inexpensive, and completely customizable, so you can add your own style make them the cases however you want them to be. The last video that we’re going to talk about is the ‘DIY Back To School Ideas & Supplies’, which was uploaded on July 25th, 2015 (you can check out the video below). This video will show you how to make cool pencil holders, customized pencils & glue sticks, keychains, paper clips, and bookmarks, all inspired by some of the summer’s hottest movies. These are super easy/fun projects that you can do in order to have unique school supplies that everyone will be jealous of, or you can get your friends together, and go to school with really awesome matching school supplies that no one else will have. The possibilities are truly endless!!! All credit goes to YouTube, Twitter, Instagram, Tumblr, DIYlover89, theclassifiedplus.com, all of the businesses, companies, people, stores, and any other original owners involved and/or mentioned in any of these videos, any and all companies, individuals, and/or businesses that should receive credit for anything mentioned in this blog post, and all original owners. I do not own anything in this blog. If any people, corporations, businesses, companies, etc, were not previously given credit for their work, they are given credit now and their previous absence was unintentional. All opinions expressed in this blog are my own. I wrote this blog for entertainment purposes and no copyright infringement is intended. celindareyesblog August 5, 2015 No Comments on YouTube Wednesday: DIYlover…the YouTube channel that should be at the top of your Back To School list. Category: YouTube Wednesday. Tagged: amazizng, back, clothes, college, cool, cute, DIY, DIYlover89, fall, fashion, high school, instagram, minions, new, Paper Towns, school, spring, summer, theclassifiedplus.com, to, tumblr, twitter, unique, winter, youtube, youtuber.